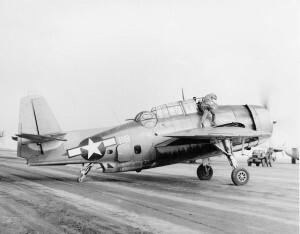 On May 9, 1944, a TBM-1C Avenger, (Bu. No. 45503), took off from Groton Field with a three-man crew aboard. After climbing to an altitude of 500 feet the engine suddenly backfired and quit. The pilot was unable to restart the engine, and the plane crashed in a wooded area of the Noank section of Groton. The crew escaped with non-life-threatening injuries – the aircraft was consumed by fire. U. S. Navy accident report dated May 9, 1944. On the night of July 4, 1945, a group of navy aircraft were making a series of landings and takeoffs at the Groton Naval Auxiliary Air Field as part of a training exercise. One of the aircraft taking part was an F6F-5 Hellcat, (Bu. No. 70879). 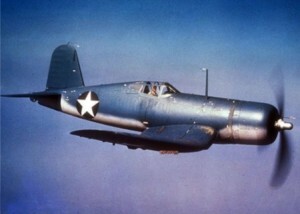 Another aircraft was an F4U Corsair, (Bu. No. 81612). 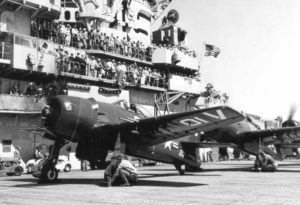 Shortly before 11:00 p.m., the Corsair made a normal landing and taxied towards the end of the runway while the Hellcat made its approach and landed. 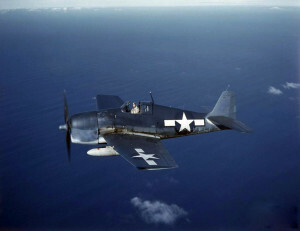 The Hellcat landed at a normal speed and proper interval from the Corsair however, due to excessive darkness, what the pilot of the Hellcat didn’t realize was that the Corsair hadn’t completely cleared the end of the runway. At 170 feet before the end of the runway the Hellcat drove into the rear of the Corsair completely demolishing the Corsair, and causing substantial damage to the Hellcat. Fortunately neither pilot was seriously hurt. Source: U.S. Navy Accident report dated July 4, 1945.